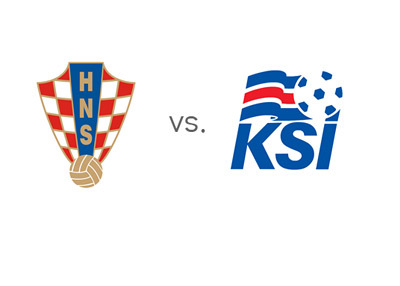 Croatia will host Iceland on Tuesday, November 19th, 2013 in the second leg of the World Cup qualifications playoff at Maksimir Stadion in Zagreb. The result from the first leg match is 0-0. Croatia outplayed Iceland in the first leg match, but did not score even with the one man advantage they had for most of the second half. Croatia have scored twelve goals in their last eleven World Cup qualifying matches and are hoping to be on top of their game on Tuesday. They will look to attack from the start and score early. Iceland played defensively in the first match and managed to hold on to a draw. They are looking to make history as the smallest nation to participate in the World Cup tournament. Iceland will probably look to 'park the bus' in front of their goal and hope Gudjohnsen up front can hit the net on the counter. Croatia are the big favourites to win and qualify for the World Cup in front of their own fans. A 100 € bet on Croatia to win could return 33 € in profit. A 100 € bet on Croatia to qualify could return 22 € in profit. A 100 € bet on Iceland to win could return 1,000 € in profit. A 100 € bet on Iceland to qualify could return 333 € in profit. This should be a good game. Croatia have a squad full of experienced international players, including Mario Mandzukic from Bayern Munich and Luka Modric from Real Madrid. Iceland are relying on their young and fearless squad to write history. Mario Mandzukic is the favourite to score for the hosts at 7/5, followed by Eduardo Da Silva and Nikica Jelavic who are both valued at 8/5. Eidur Gudjohnsen is the favourite to score for Iceland at 6/1. Can Iceland make the headlines on Tuesday, or will Croatia find their long lost form and show that they are still a side to be feared of in international football? Let's see how things play out in Zagreb.